I’m a sporty girl – there’s no denying that. Growing up with two older brothers well into their football, I was always encouraged to join sports teams and stay fit and healthy. I followed my brother’s footsteps in high school and played for my local Women’s Football team, and took up Netball in my early teens too. I was always in the ‘sporty crowd’ at school, and to some extent, that’s followed me to university. I’m part of my University Netball Club, train with them 3 times a week (one of which being a 7am fitness session! ), as well as a weekly match. I think it’s fair to say I’m kept quite fit with all this exercise. But University isn’t all the time, and neither is the netball league. I have 4 weeks off over Christmas and Easter, and a ridiculous 3 months at Summer. It won’t be long until I’m left without these opportunities, so today I thought I’d share the 5 ways I motivate myself to keep fit! For me, scheduling helps with every part of life. Each week I plan everything I’m doing, what jobs need done and where I need to be and when. When I plan the week, I like to note in when I’m doing exercise too, whatever this may be! If I write down that I’m going to the gym at 2pm on Wednesday, I can’t go back on my word. This is something I really want to introduce when I move back home in the Summer. I love Netball, and I love the gym, but sometimes it’s not enough to get me up and going. This Summer I really want to take up Swimming. My family are all members of our local gym which has a swimming pool too. I used to swim a lot when I was a kid, but as I grew up I went less and less, and I find it really sad how much I struggle swimming underwater or for a long period of time when I go on holidays nowadays. Swimming is such a great form of exercise and it’s not too strenuous either! This hack always works for me. I recently got a new matching Gymshark set from Jamie for Christmas and just couldn’t wait to get myself in the gym and show it off. 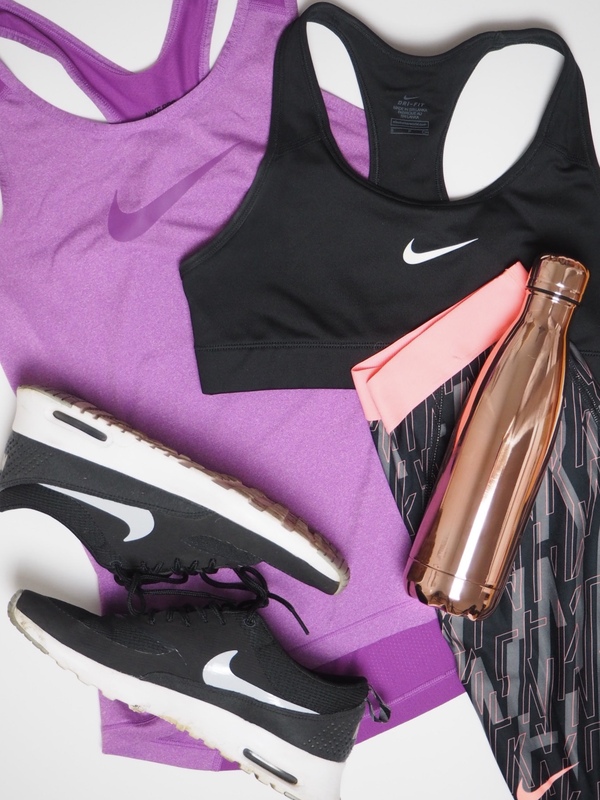 Not only new gear, but clothes you feel good in can really motivate you to workout. Not so great for your bank balance, but worth it for your fitness and health. I suppose if I’m going to take up swimming again, I’ll have to get my hands on some new swimming costumes.. I don’t go to the gym very often when Netball season is in full swing, but on quieter months or when I’m at home I like to take a trip up the gym. In the last few years Jamie has given me a whole new love for weight training, and one thing I love about weights is how easy it is to track your progress. I like to use my notes app to keep track of what weight I’m at for everything, and for how many reps. Tracking your progress, whether it’s how much you’re lifting, or how long it takes to run however far, can make a real difference. Seeing how you’re improving is for sure one of the best ways to keep pushing you to workout! Training with other people or friends is another brilliant way to motivate yourself. This could be simply doing a workout group class, or meeting up with friends. I like to train with Jamie every now and then because I not only learn a lot from him, he motivates me too! I nearly always reach a new PB when I’m with him. Training with other people also means they’re relying on me to turn up, and I can’t let them down! What are your top tips for motivation to stay fit? "Clear Skin with T-Zone Skincare"